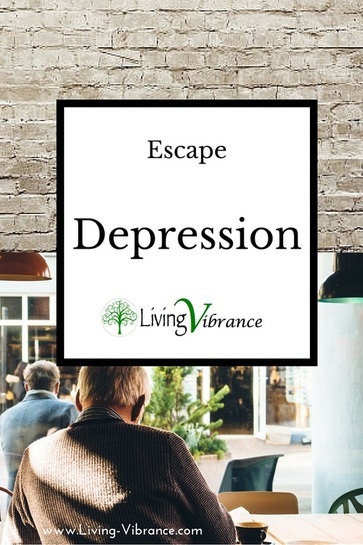 Due to the complex and independent make up of each individual as well as the variables and depths that trigger and maintain depression; this article will focus on mild depression called Dysthymia. The advice and tips stated have very high success when considered and applied conscientiously and routinely while your symptoms and mindset are healing and the long-term cause is being addressed. Also note that although applying all the following information may seem overwhelming, the key is to actually start applying the habits you are comfortable with! For example, if exercise is not your thing, don’t pressure yourself! Start with food changes and find a therapist to start with. Any change is better than none! The Mental Driver- Seek a Therapist. Reason 1: Research has shown that patients who seek and ensure a mental support system, have encountered lower relapse rates, more effective and faster recoveries compared to those who only used physical treatments such as anti-depressants. Reason 2: There is usually a mental anxiety associated or driving depression, you need to address this, it’s probably the most important thing you need to do. Something within your lifestyle and day-to-day life is bringing you down, wearing you out and depleting your physical resources. Hate your job? Bored and unappreciated within your marriage? Previous trauma? Or just not where you want to be? Whatever the reason, seek a therapist, dissolve the stress surrounding the issue, and resolve it. As you can see, keeping it in your mind growing and niggling at you isn’t working very well. Don’t skimp on this step, you’ll be amazed at how efficient therapy is when you find someone that’s right for you, whether it be a Counsellor, Kinesiologist or whatever modality you’re most comfortable with, the results on your wellbeing, future, and lifestyle will pay you back ten-fold the initial investment you injected. The Physical Driver- Does Your Body Have What It Needs To Feel Good?? Alright, so, people seem to freak out about this one, they seem to think you have to turn into a major health junkie, the idea of making even a small change is just ‘oh yeah’, but can’t be bothered. I have never quite understood this, food is the BIGGEST fuel your body needs, yes, it is a kind machine that will adapt and do its best even when we feed it junk. BUT of course, you will feel the effects if you simply do not provide it with what it fundamentally needs to serve you and run efficiently. Having said that, I think that overdriving ourselves and putting too many restrictions in our lifestyles is counter-productive, so, ALL YOU NEED TO DO is increase certain foods and drop others. Think of it like tipping the scales back into a better equilibrium. That way, you don’t have all the cravings and torment but you are essentially going back into the right direction. Once started, the inertia increases; you feel better from having made small changes and that new found energy and motivation will provide you with further resources to further improve your lifestyle and make the necessary changes. Make a plan and hold yourself accountable for it; again, don’t go super health crazy; that’ll ensure you plunge back into the abyss! Pick 2-5 things to increase and 2-5 things to drop on a daily or weekly basis. If your day-to-day motivation is low, find a way around it; why not do a big Sunday cook-up to last you the week? Maybe juicing is best for you, or maybe hubby can back you up and cook a little more? Like I said, make a plan that you can credibly stick to and just do it, just do more than what you’re doing now! 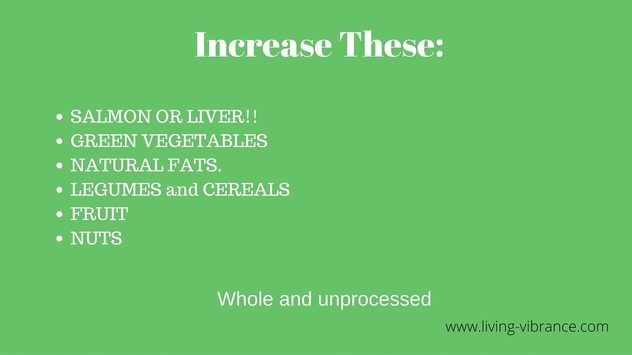 Salmon and liver are packed full of goodies for creating an abundance of hormones and neurotransmitters! Whenever I feel blue, my go-to meal for the evening will consist of one of these, and I always feel perky again the next day. Win! Green Vegetables will alkalise your body and help replenish many vitamins and minerals you may be deficient in, that, as a result can often cause anxiety and depression. 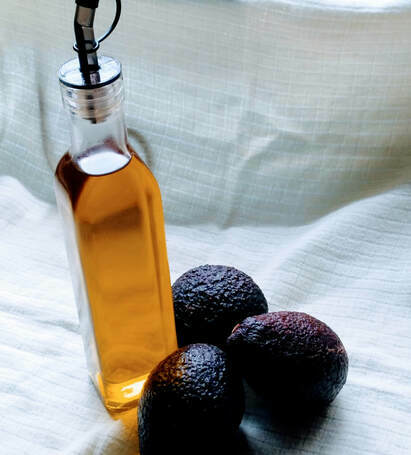 Natural Fats particularly flaxseed oil, walnut oil, fish oil and avocados. These provide you with energy and particularly Omega 3 fatty acids that ensure cell and brain function, deficiency in Omega 3s have a strong link to depressive states- load up! Legumes and Cereals not only provide you with rich sources of vitamins and minerals essential for your optimum function but will also help maintain stable blood sugar as opposed to white flour products, resulting in fewer mood swings. Why? 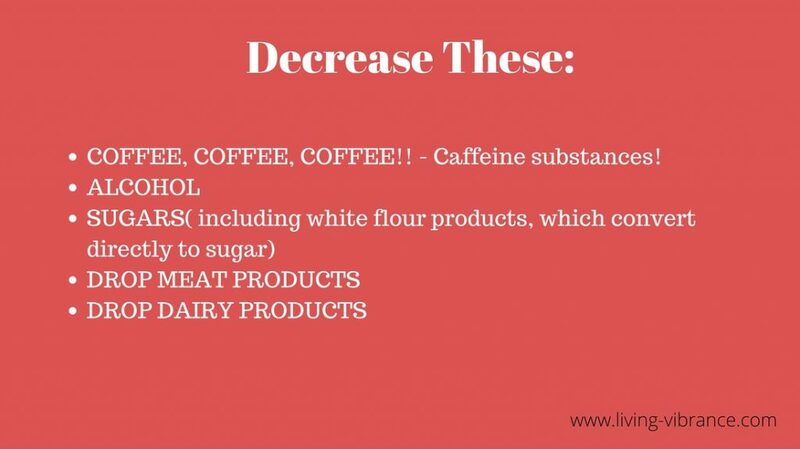 Here we are essentially dropping sugars (alcohol and flour products), minimising acidity in the body (meat and dairy) and caffeine. Caffeine and sugar combined have been found many times over to be even worst than either substance consumed alone AND to drive depressive states in patients. Exercise- The Most Potent and Underused Anti-Depressant! Review any study and you will see that exercise has profound anti-depressant effects, decreasing also anxiety and malaise. Furthermore, those who exercise benefit from increased self-esteem and happiness levels, due to a heightened levels of endorphins which are linked with mood. Pick something you actually enjoy doing! Like dancing?? Join a salsa class! Maybe you find tennis more exciting? Do it! Exercise doesn’t have to be running and weights, find an activity that you ENJOY! Join a club, mingle with others, get active and simply have fun. Nutritional Supplements and Botanical Remedies. 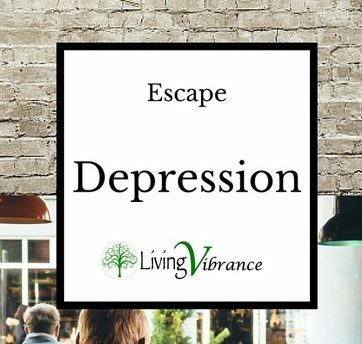 Give yourself a boost when climbing out of depression with the following;High Potency Multi-Vitamin depressed individuals often have a nutritional deficiency and a single lacking element will have a strong effect on the body. By taking a multi-vitamin, you are essentially building a solid framework to build upon. Fish Oil if your consumption of Omega 3 fatty acids is low. ​Saint John’s Wort has long been a recognized herb against mild-moderate depressive states, it has excellent results with far fewer side effects than standard anti-depressant medication, lower cost and greater patient satisfaction. In 1996 physicians prescribed it eight times more frequently than Prozac for the treatment of depression. Unfortunately, it’s safety and efficiency became so popular that a giant drug company at the time conducted a ‘study’ discrediting it’s efficacy. ​Elm- When you are feeling overwhelmed, anxious, or depressed because you are overworked or have too many responsibilities, Elm is the remedy of choice. Gentian -When you feel pessimistic, discouraged, or have lost faith. It is used for depression when a person knows the reason for his or her sadness. Gorse- When you feel hopeless, that there is nothing that can be done for you, or resigned to your less-than-ideal fate, gorse may be helpful. Mustard- Mustard is used for sadness or depression that has no apparent cause. It feels like a dark cloud has blocked out happiness and joy. Sweet Chestnut- Selected for feelings of hopelessness, Sweet Chestnut reflects a long, courageous battle that feels lost. It is particularly suited when it feels like an inner transformation is occurring and a “dying off” of a person’s old self is taking place. Willow- Willow is best suited for negativity and a tendency to blame others for the problems in life. Alternatively, if your sadness is linked to a grudge that you’re holding onto but would like to let go of, Willow is a good choice. Rescue Remedy- When you’re not sure which remedy to choose, Rescue remedy is a good choice. It is a combination of five remedies and is used to help manage stress, trauma, and, of course, sadness. I’d love to hear from you, so let me know how you go! If you have any questions or would like to have an adapted and personalized treatment plan to suit you, contact me here.